The following are the notes and slides from my part of the meeting, plus some links/materials beyond what my presentation time would permit. If you want a PDF version of my Web F​ont Design: You Don't Have To Be Angry Anymore slides, please select this link. Jan's part of the presentation is the main focus of the talk. This is because while it is now easy to add web fonts, it is now also easy to make bad font choices. Here are Jan's slides as a PDF file. 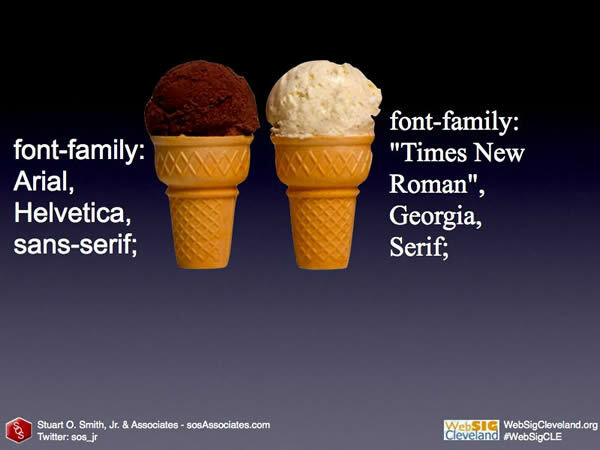 This talk showed a brief history of font use on websites, and showed how easy it is to add web fonts to websites today. I would be interested in doing a more in-depth talk at a future WebSigCleveland.org meeting in the fall. During the meeting, I tweeted important links and some resources beyond the talk. 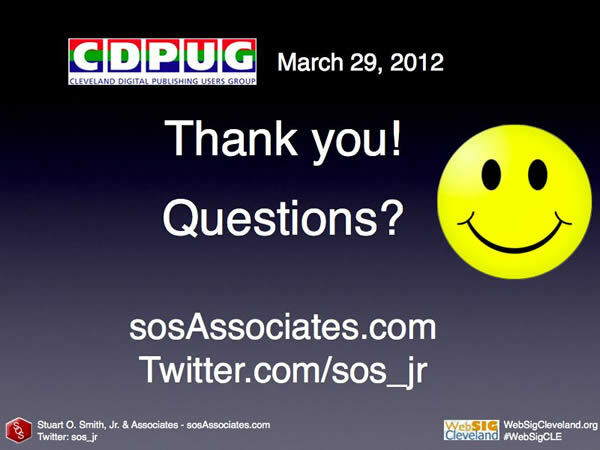 I also encouraged others to add to the discussion online via Twitter using the hashtag of #CDPUG. At #CDPUG right now sos_jr is giving the history of font use in web design. RT "@sos_jr: Learning about CSS3 Font Properties (@font-face; font-size-adjust; font-stretch):w3schools.com/cssref #CDPUG"
#CDPUG @SpikeRadway is wearing the coolest font shirt. Wish I had one. #CDPUG thanks @sos_jrgreat presentation on web font resources. Agreed! RT @4debbiekennedy #CDPUG thanks @sos_jrgreat presentation on web font resources. RT "@sos_jr: Watch "Font Conference" by @CollegeHumor in @janbits presentation at #CDPUG.youtu.be/i3k5oY9AHHM "
To quote Henry Ford from his autobiography: "Any customer can have a car painted any color that he wants so long as it is black." Thinking of early computers and the first use of the Internet made me think of this quote. The user had to be happy to just have the internet as a new tool; they could not control how things looked. Monospaced fonts, which had a fixed width between letters, was the standard for the first computers & computer terminals. These early computer screens could fill your appetite for knowledge, but were not as "tasty" (note empty ice cream cone) as today's computers. I recommend reading over the History of the World Wide Web section on Wikipedia. I found it interesting to see the orginal writing from August 6, 1991, from Berners-Lee, introducing the idea of the World Wide Web project on the alt.hypertext newsgroup. The focus was on the importance of an easy way to share information. This is way before the ideas of design that are the focus of today's talk. The World Wide Web Consortium (W3C) is the organization resonsible for creating the open standards for the World Wide Web. Its mission: The W3C mission is to lead the World Wide Web to its full potential by developing protocols and guidelines that ensure the long-term growth of the Web. ...the method used by the HTML <font> tag led to very complex markup that was very difficult to manage. 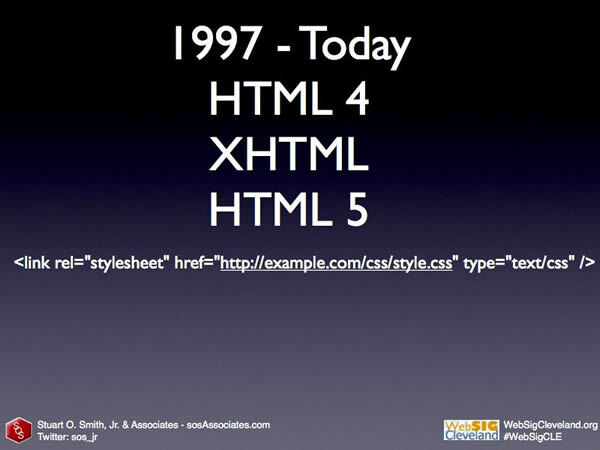 With the W3C recommendation, in December 18, 1997 (less than a year since the <font> tag recommendation), the <font> tag became deprecated in HTML 4.0. 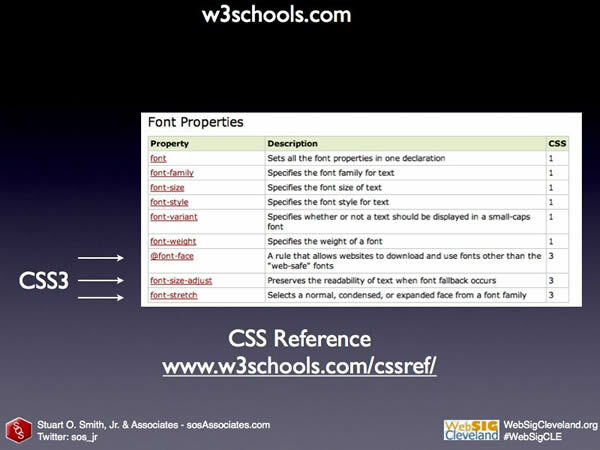 Note in the graphic above how the amount of HTML markup to declare the font is more than that of the content it modifies. The W3C leadership knew that there had to be a better way. From personal experience, I can remember that for what felt like a long time after the <font> tag became deprecated, it was still being used. This was because it was supported by the browsers of the day (unlike the newer methods). Also, I remember that products like Macromedia (now Adobe) Dreamweaver still used the <font> tag in the early 2000s. Today we use Cascading Style Sheets (CSS) to remove the design elements from the content elements. 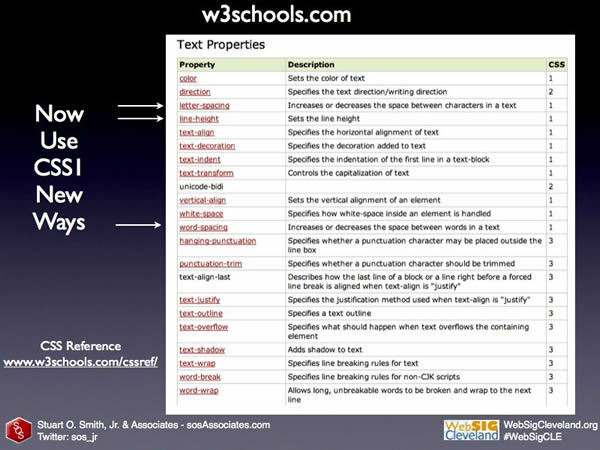 The W3C states: "Cascading Style Sheets (CSS) is a simple mechanism for adding style (e.g., fonts, colors, spacing) to Web documents." It can be used with the curent forms of HTML (HTML4, XHTML, HTML5). CSS has the advantage of making it easy to update the design all your HTML pages from a remote CSS file, plus using responsive website design techniques, a website designer can have the design change based on the device being used. For example, a smartphone, a tablet, and a laptop can all get different design layouts. sosAssociates.com is designed using this technique. This brings us to where we were at the CDPUG meeting: "Web Design, HTML and Beyond." 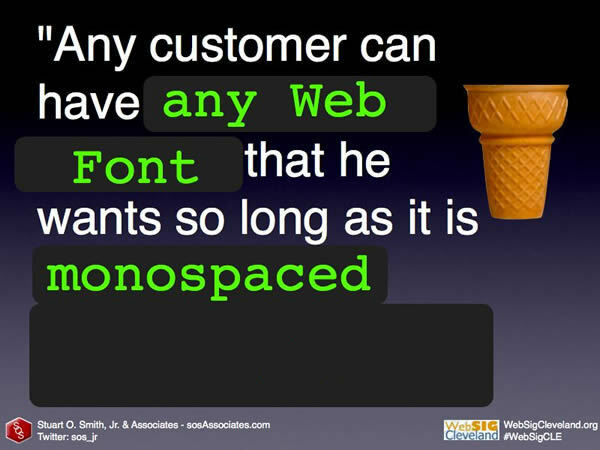 Designers historically have been limited to the fonts on the local computers of the website visitors, with no control and only a limited number of choices. Luckily, this is no longer the case. 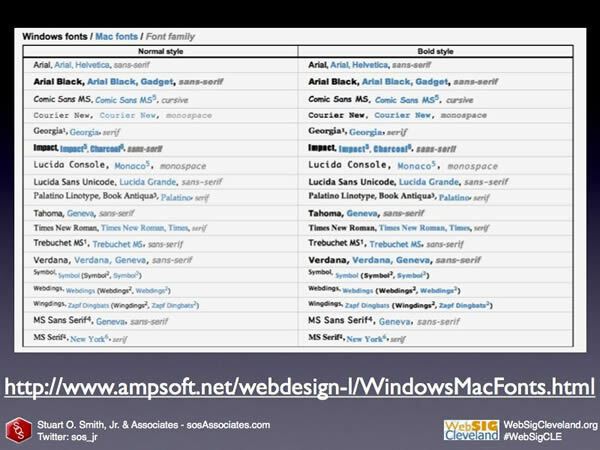 Here is a 2008 article about fonts common to all versions of Windows & Mac. In late 2010, a revolution had begun! New font services offered many opportunities! 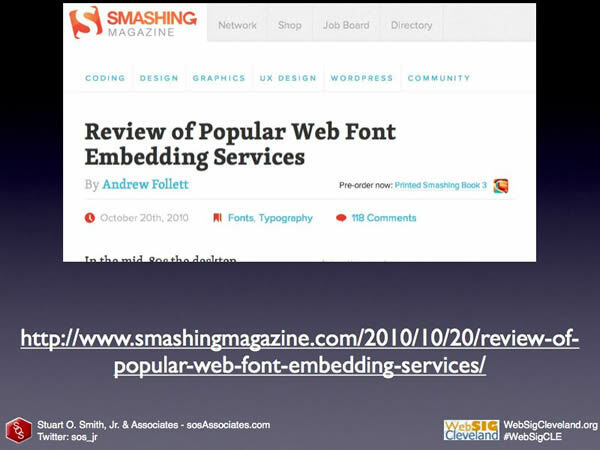 This article provides you with links and reviews of the top font embedding sevices. Thousands of tasty fonts to choose from! 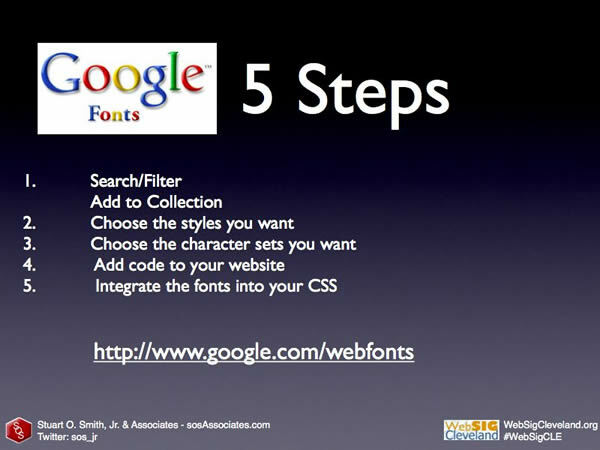 Go to Google Fonts to learn the five easy steps to add their web fonts to your website. 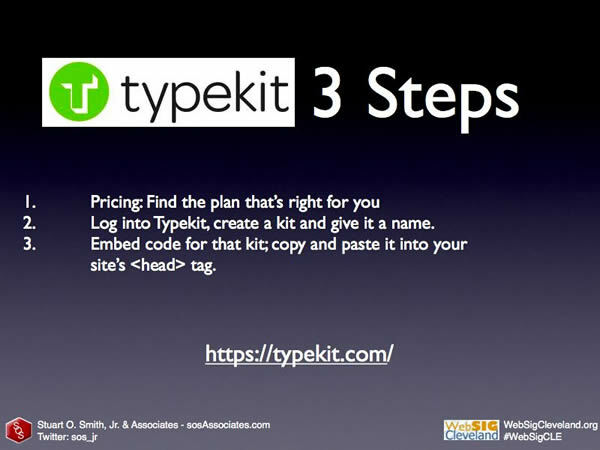 Typekit: has three simple steps to embed web fonts. 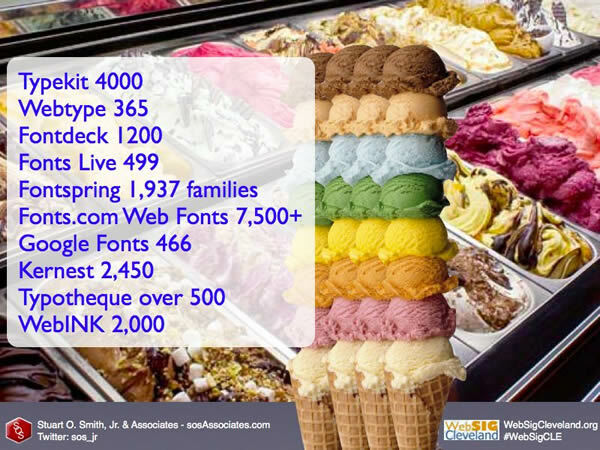 Here is an example of Typekit fonts. 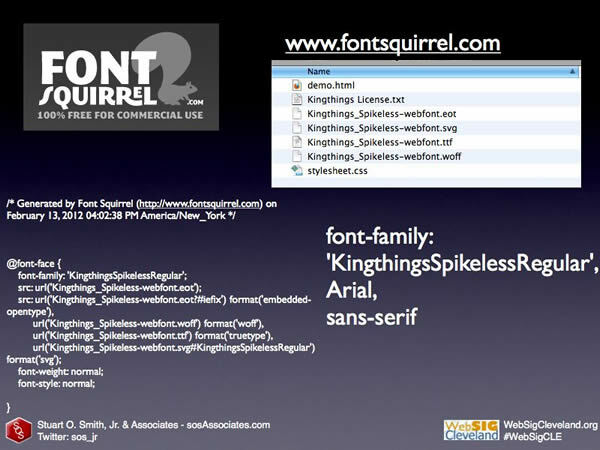 Font Squirrel lets you download free fonts to use on your website. Web Font Design talk # CDPUG super! Enjoyed different perspectives together. Worked well. 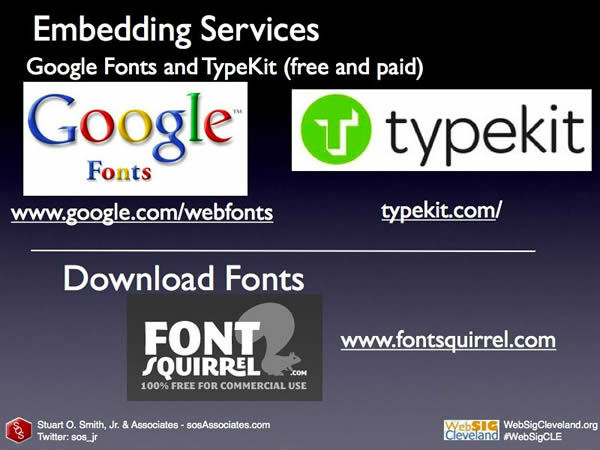 Looking forward to trying Google, Type Kit & Font Squirrel. Thanks for great collection...This font will be helpful for my web design process.